Estuary English is a name given to the form(s) of English widely spoken in and around London and, more generally, in the southeast of England — along the river Thames and its estuary. On this website we hope to bring together as many documents as possible that relate to Estuary English, as a convenient resource for the many interested enquirers. No accent is intrinsically good or bad, but it has to be recognized that the way we perceive accents does play a role in our attitude to others. Different people have differing perceptions. So there are significant numbers of young people who see Estuary English as modern, up-front, high on 'street cred' and ideal for image-conscious trendsetters. Others regard it as projecting an approachable, informal and flexible image. Whereas RP, Queen's English, Oxford English and Sloane Ranger English are all increasingly perceived as exclusive and formal. —Paul Coggle, 1993, in Do you speak Estuary? Joanna Przedlacka, 2002. Estuary English? A sociophonetic study of teenage speech in the Home Counties. ISBN 3-631-39340-7, pb. Bern: Peter Lang (ordering info). Demolishes the claim that EE is a single entity sweeping the southeast. Rather, we have various sound changes emanating from working-class London speech, each spreading independently. Recommended. See my handout. Ulrike Altendorf, 2003. Estuary English. Levelling at the Interface of RP and South-Eastern British English. ISBN: 3-8233-6022-1 Tübingen: Gunter Narr (summary; sample chapter: Explaining results). Steve Crancher, 2002. Dijja wanna say sumfing?. Ian Henry Pubs. Not serious. Paul Coggle, 1993. Do you speak Estuary?. The new Standard English – How to spot it and speak it. ISBN 0 7475 1656 1. London: Bloomsbury. Do not be misled by the title of the work Shallow-Water Dictionary; A Grounding In Estuary English, by Stilgoe, John R., Paperback - 48 pages (August 1994) Princeton Architectural Press; ISBN: 1568980299. The blurb reads: "Stilgoe's definitions are lyric explanations of the vernacular language of America's nearly extinct shallow-water regions." A blow for Rosewarne's London-centred view of the universe. Estuary Engish. The Times Ed. Supp. article that started it all (David Rosewarne, 1984). With a biographical note (1999). 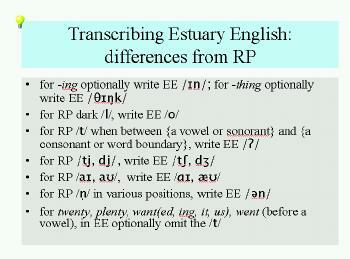 From "RP" to "Estuary English": the concept 'received' and the debate about British pronunciation standards. Acrobat. (Original English version, Gudrun Parsons, 1998.) Also the German version: Von "RP" zu "Estuary English": der Begriff 'received' und die Diskussion um einen britischen Aussprachestandard. University of Hamburg MA dissertation. 120 pp. Acrobat. (Gudrun Parsons, 1998). Untersuchungen zum `Estuary English' an einer `Public School' in Südengland. University of Münster dissertation. 109 pp. [Investigations of Estuary English at a public school in the south of England. In German. Acrobat version only.] (Carsten Hüttermann, 1999). Yes, EE has penetrated the public schools, though it's the RP end of the EE spectrum, and the boys rather more than the girls. Meticulous discussion. The author would welcome comments or discussion. Diagrams in a separate file. Estuary English: is English going Cockney? Moderna Språk, XCIII, 1, 1-11 Acrobat version only. (Ulrike Altendorf, 1999) Well, up to a point -- plenty of l-vocalisation; t-glottalling in certain environments; but no th-fronting in EE. The case of Estuary English: supposed evidence and a perceptual approach (Ruedi Haenni, 1999). University of Basel dissertation. 125 pp + appendices. Acrobat version only. A fascinating study of how people perceive accents. Haenni comes to the view that "there is no convincing way to describe (let alone to define) the concept [of EE] conclusively. [...] It is thus very difficult to uphold the notion of EE as a distinct variety in its own right." The author would welcome comments or discussion. 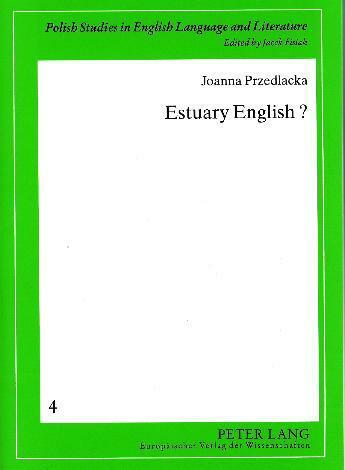 Estuary English - a sociophonetic study (Joanna Przedlacka, 1999). PhD dissertation, University of Warsaw. Read a summary, including sound files (.wav), on the author's home page; also a related article, Estuary English and RP: some recent findings. "I did fieldwork in four Home Counties: Buckinghamshire, Kent,Essex and Surrey. Fourteen sociophonetic variables were investigated in the study. I looked at differences between thecounties, male and female speakers and two social classes. All data came from a word elicitation task from sixteen teenagespeakers. The study showed that there is no homogeneity in the accents spoken in the area..."
El inglés del estuario y las innovaciones fonéticas del habla londinense. ['Estuary English and the phonetic innovations in London speech'. In Spanish.] Acrobat version only. Antonio Lillo, Univ. de Alicante. Published in Atlantis, 21 (1999): 59-77. Includes a good bibliography. See also 'South East London English: discrete versus continuous modelling of consonantal reduction' (Laura Tollfree, 1999), in Foulkes, P. and Docherty, G.J. (eds. ), Urban Voices, London: Arnold, 1999. Estuary English - Entwicklung, linguistische Beschreibung und sozialer Hintergrund. 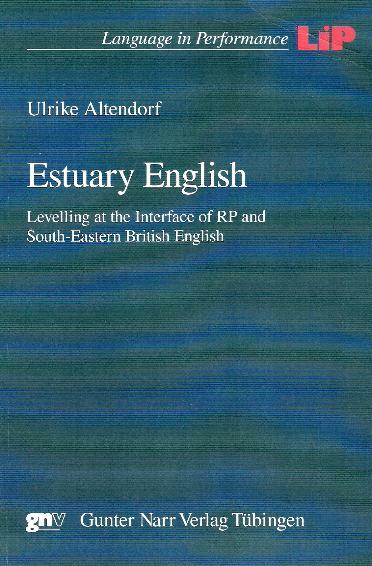 ['Estuary English - development, linguistic description and social background'. In German.] (Lothar Hilgers, 2000) Word document. Requires SIL Manuscript IPA93 font. Univ. of Trier master's dissertation. "Many of these features can indeed be found on radio news (though in most cases not in very high proportions), some of them even on the most prestigious station (Radio 4). Nevertheless, they are mostly in evidence on those stations that are mainly addressed to younger people (Virgin Radio, Radio 1)... For me EE is not the future RP, but only one (though possibly the most important one) of several regionally modified versions that altogether might take over the place of traditional RP." 1. 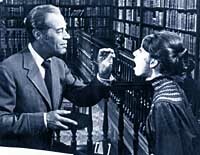 T-glottalling in modern RP is stable in pre-consonantal environments in both speechstyles and is accepted by these speakers in formal and non-formal speech. 2. It has entered modern RP as a vernacular change (spreading out from London), but itsvernacular status is obscured by other factors. 3. It has to some extent lost its stigma, but not yet acquired prestige, in word-final pre-pausaland pre-vocalic environments. The sociolinguistics of modern RP (Peter Trudgill, forthcoming). A chapter from his book Sociolinguistic Variation and Change, due out in 2001. Includes (towards the end) a discussion of EE. The author does not agree that it would now make moresense to teach EFL learners 'Estuary English' rather than RP. Dialect levelling and received pronunciation (Paul Kerswill, 2000). An article originally published as Mobility, meritocracy and dialect levelling: the fading (and phasing) out of Received Pronunciation, in Pilvi Rajame (ed.) (2001). British Studies in the New Millennium: Challenge of the Grassroots. Proceedings of the 3rd Tartu Conference on British Studies, University of Tartu, Estonia, August 2000. Contains a section on EE, where Kerswill holds Mrs Thatcher responsible (almost) for the spread of EE. The establishment of the English RP accent : a flawed interpretation? (John Honey, 2000). A review article of Linda Mugglestone, Talking Proper, published in Bulletin of the International Association of University Professors of English, Autumn 2000. This is the same John Honey whose book Language is Power is reviewed below (section 5), and whose political views on language differ from those of most linguists. Estuary English — the new classless accent? (Guðlaug Hilmarsdóttir). BA dissertation. Includes a sound clip of David Beckham with transcription and phonetic analysis. 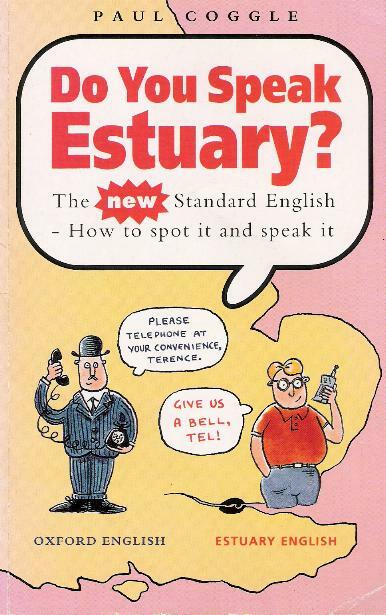 Estuary English - handout for lecture in the UCL P&L course PLINX202 English accents. Read in conjunction with my Przedlacka handout. See also the preceding lectures on Cockney. (J.C.Wells, revised 2004). The Bergen Corpus of London Teenage English. A scholarly research project in Norway. Don't believe everything you read here! There's tendentious reporting, unsupported claims, and sensational exaggeration... but it tells you what people are thinking and sometimes alerts you to new research. We're gradually adding older archive material, as well as new stuff. Original graphics may be missing, and original links may not work. Teletotties say 'rilly gid'. Feature article in the Sunday Times (Philip Norman, 14 Feb. 1999). Pronunciation trends among presenters of children's TV. The author thinks that EE is found only in Essex, so doesn't call these trends EE. He draws attention to developments in the vowels /ʊ/ and /əʊ/, to the supposed loss of /t/ (actually, glottalling), and to various lexical matters. Glaswegian tainted by the strains of Sarf Lunnun. Feature article in The Independent. Developments in Glaswegian English that may reflect features of EE. (Fred Bridgland, 28 June 2000). Scousers put the accent on success. Feature article in The Guardian. Claims that Liverpool speech is now favoured for call centres, while "estuary English, the recognised accent of the south east, appears less popular: east London, Reading and Southend finished near the bottom of the list.". (David Ward, 22 Sep 2000). Scouse accent kills Lisa's Dublin dream. News article from The Irish Post (17 Mar 2001): not about EE, but showing that accent discrimination is alive and well... in Ireland. Geordie dialect gannin out of fashion. Feature article in The Guardian (Martin Wainwright, Friday April 6, 2001). Reported demise much exaggerated. Speak proper? Not likely. Feature article from the Sunday Times (India Knight, 11 Nov 2001). Claims that the only speakers discriminated against nowadays are the speakers of RP. Finding a gag that takes the biscuit (excerpt). Part of a feature from the Guardian (22 Dec 2001). With comments from JCW. All raait! It's a new black-white lingo. Article from the Sunday Times (Steven Swinford and Laura St Quinton, 11 Dec 2005). Britain's "first multi-ethnic dialect" in inner-city London. There is a peculiar pronunciation common to Londoners, and the stranger who has a careful ear can at once distinguish it from the pronunciation of Manchester or Bristol, and easily from that of an American. J.C.Wells home page and e-mail.